MTF Synthetic Synchromesh Transmission Fluid 5W-30 is designed for certain manual transmissions that require an engine oil formulation. Unlike its mineral oil counterparts, MTF prevents the thinning effects of mechanical shear for stable viscosity, superior film strength and anti-wear performance. It protects against rust, keeps seals soft for long life, and is compatible with brass synchro's for smooth synchromesh shift quality. AMSOIL Synthetic Synchromesh Transmission Fluid (MTF) is specifically designed for manual transmissions and transaxles with synchromesh systems that require light viscosity, non-extreme pressure fortified oil. It is formulated with advanced additive technology to provide proper friction characteristics for smooth shifting without grinding or bump shifting, while providing the ultimate in gear and bearing protection. Call us at 1-800-579-0580 for preferred customer ordering (best price). AMSOIL Synthetic Synchromesh Transmission Fluid (MTF) outperforms conventional oils and protects internal components at extreme temperatures from -40°F to 300°F. It controls the thinning effects of mechanical shear for stable viscosity and superior film strength, providing better anti-wear performance than conventional oils over significantly longer periods of stress. AMSOIL Synthetic Synchromesh Transmission Fluid (MTF) contains friction modifiers for superior synchronizer compatibility and smooth shifting. It is non-corrosive to yellow metals, and its outstanding anti-wear properties protect gears and bearings under severe duty. MTF is anti-foam fortified and contains oxidation inhibitors to resist high temperatures, oxidation, acid buildup and varnish deposits. 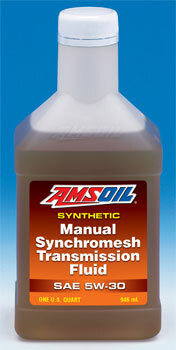 Recommended for automotive and light truck applications that require synchromesh transmission fluid. Applications include manual transmissions and transaxles such as New Venture NV T350, NV 1500, NV 2550, NV 3500, NV 3550, NV 5600, and Tremec T4, T5, T18, T56, T176, TKO500, TKO600, TR 3450 and TR 3550. Replaces MTF-94 fluid for Land Rover, MG, and Mini Cooper. Replaces Honda Genuine MTF fluid for manual transaxles and Texaco MTX fluid. Not for use in engines, hypoid rear axles, limited-slip or wet clutch applications. (Note: AMSOIL also costs less than the OEM product) Quaker State, Pennzoil and Texaco also sell a 5W30 type transmission fluid, however the minimum purchase for each if them is a case of 12 quarts and not readily available. MTF is available in quarts, quart cases, and 5-gallon pails. We get many satisfied calls from the performance of this product. Thank you for ordering with us!